When water is streaming through your home, of course, you will do anything to stop the flow. However, when the leak is out of sight, it is also out of mind. Ignoring water damage can lead to even more costly repairs. This secondary destruction damages the physical structure of a property, increases mold growth, and produces an unpleasant odor. Multiple systems in your home suffer from long term exposure to water including your electrical system. Left unattended, moisture can cause electrical shorts and damage to your circuits. Not only is this expensive, but also a dangerous opportunity for a house fire. Not repairing water damaged ceilings or drywall at the first sign can lead to a larger area of damage, wall paint discoloration, or plaster bulging. The water can also damage mounted lights and ceiling fans. More than just creating unsightly stains, the water can damage the underlying materials. Carpet is not meant to be constantly wet, so leaving water untreated will cause your carpet to break down. If you leave it for too long and the padding below the carpet and subfloor will start to weaken, loosen, decay and warp. Then you’ll have to replace the floor covering and perhaps the floor itself. Although plumbing is designed to flow for years, standard household plumbing is only intended to interact with regular tap water. Rusty, damaged pipes or flood water could have chemicals, minerals, or other contaminants in it that can react with the pipes in your floors and walls. Over time, this can cause leaks, furthering the original water damage problem. 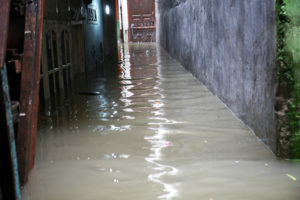 Water weakens wooden floors and walls. Wood acts like a sponge so water damage to hardwood floors can lead to warping and buckling. Wood floors may become unsalvageable. If you wait too long, the structure of your house can become compromised. Dripping water can even lead to holes in your concrete and affect the foundation and make your home structurally unsound, according to ERX experts. When drywall starts to absorb water from a leaky pipe or other forms of water, it begins to warp and swell. Materials such as support beams can affect the integrity of the home. However, even the simplest warping can lead to an unsightly hole in the wall, which if combined with a mold outbreak can quickly turn things from simply ugly to unlivable. One of the biggest consequences of water damage to your health is the growth of molds and fungi within the home. In the presence of water, mold spores fill the affected area with unsightly and unhealthy mold growth. Standing water attracts bugs, bacteria, and fungus. Many insects look for still water to lay their eggs, spreading bacteria, and disease. The evaporating water makes the air very humid, which helps spread mold and mildew. The odor then attracts more insects, adding to the unhealthy cycle. Water damage lowers the value of your home. If you try to patch and paint over a problem, eventually a home inspector will find and document it. If not properly addressed, potential buyers will counter offer less money AND still expect you to fix it. Taking care of water leaks right away will prevent damage and help to maintain the value of your home, however, if disaster strikes, have no fear because this is where ERX Emergency Restoration steps in! The ERX Team will respond quickly to your water damage cleanup emergency and will get to work drying your home, business and/or belongings. ERX Emergency Restoration uses the latest technology to remove water and to dry floors, walls and ceilings, saving you both time and money plus your valuable belongings. Technicians have extensive training in water removal and water damage cleanup. In the Las Vegas area, ERX Emergency Restoration Experts has an emergency line for 24 hour service at 702-830-9444, an office line at 702-500-1780, and an online contact form at erxlasvegas.com Call ERX Emergency Restoration Experts as soon as you can after water damage has occurred.